SwingSeat Pro's patented mechanism and contoured cushions perfectly counterbalance the body when moving from one task to another. Once seated, the SwingSeat Pro senses the position of the individual's body and independently adjusts the seat and backrest to perfectly align to them because the movement of the chair is in perfect synche with all body movements. Go ahead and reach forward to answer the phone, lean back to relax, sit up to work at the desk; the SwingSeat Pro's seat and backrest automatically provide superb comfort and support. 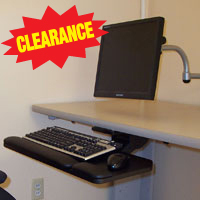 This permits the user to concentrate 100% of their effort on their work while enjoying the wonderful benefits of natural motion because the SwingSeat Pro allows continuously varying postures without having to make any adjustments to the chair. The SwingSeat Pro is the only chair in the world that allows the body to move naturally, in the same manner as when walking, swimming and dancing. 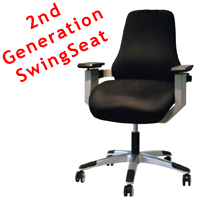 The unique automatic dynamic adjustment which is key to the design of the SwingSeat Pro means that adjustment levers and complicated controls are not required. As tasks and chair demands change throughout the day, the chair will automatically adjust, picking up on the kinesthetics of the individual. The SwingSeat Pro Executive Chair with Headrest provides great support to the low and mid-back and features a sculpted back which provides lumbar support. The Headrest cradles the head and helps support it and the neck for those needing that extra support. 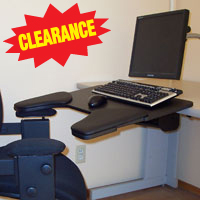 If a chair without headrest is desired, consider the SwingSeat Pro Ergonomic Back Support Office Chair. NOTE: This chair does not ship assembled, minimal hand assembly (no tools) required. Which cylinder should I get? The SwingSeat Pro Executive Chair provides great support to the low and mid-back and features a sculpted back which provides lumbar support. 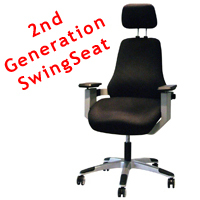 If a chair with headrest is desired, consider the SwingSeat Pro Executive Chair with Headrest.